I was worried that staying in the hotel would be really hard but it wasnt too bad. Zachary didnt seem to really enjoy the porta crib but Olivia did great in the big hotel bed. Its a long drive from Ontario, Oregon to Ferndale, Washington in case you were wondering. I was worried that we would have to stop for Zachary and that he would be the one that would be crying but nope it was our sweet angel Olivia who made the trip really long. She just was unhappy and wanted the world to know it. Zachary on the other hand was delightful, go figure! 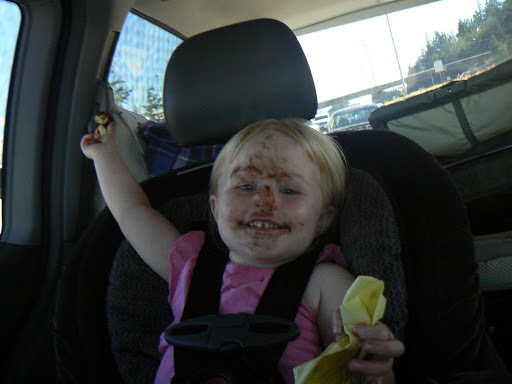 Rob thought that giving Olivia a doughnut would help her to be good, you can see by the picture that it just made a mess. We made it to Ferndale just in time to have dinner with my mom, Dave, and Jen and then we went to get settled in at Richard and Linda’s. Okay I guess it has been a month since we left on vacation so its about time to post how it went! We loaded up the van and took off about noon from our house on the way to Ontario, Oregon where we stayed the night. It was a long drive, Olivia cried, kicked my seat, begged to go home it was a relief to make it to our hotel. Grandpa Mike met us there and we all went to a yummy pizza buffet then we took him back to the hotel so he could get some sleep before his shift started. We then did some shopping at Walmart, which was sorted fun since Oregon doesnt have sales tax. 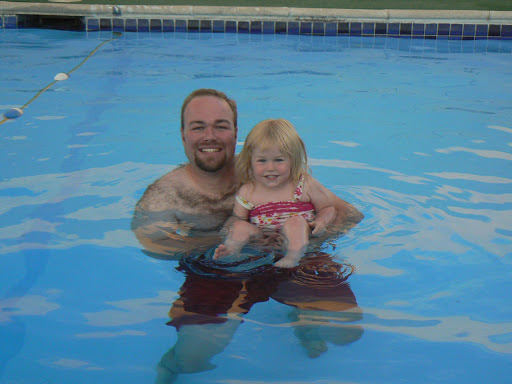 Then we went back to the hotel and Rob and Olivia went swimming. Olivia had a blast!